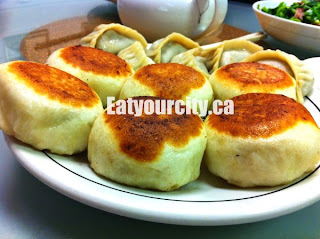 Eat Your City: Shanghai 456 - now with special pan fried buns or san jeen bao weekends only! Been craving Shanghai 456's tasty xiao long bao and potstickers, so we round up the crew (and my family) for dimsum style dishes alongside traditional Shanghainese cuisine. The unpretentious decor hasn't changed and neither has the badly translated menu, but there is something new. Special pan fried buns or "san jeen bao" to be correct. Only available on the weekends, these are a must have... a simple meat and soup filled bun, pan fried till its super crispy on the outside and bursting with savory yumminess on the inside. Hoohhhh! Add to the fact that Chef Wong personally trained practically anyone (good) who makes xiao long bao in Vancouver and in restaurants in China, we're practically bouncing in our chairs in anticipation. 1) The traditional "san jeen bao" or pan fried buns - literally translated as "fried from scratch" are addictively good, and fairly large. About the size of a small fist, these slightly flattened buns have a paper thin crisp yet tender exterior, with the insides just bursting with hot savory juices and a meat patty. Be careful as they are super hot, and you may squirt a neighbour when you bite into it. Available only on weekends, make sure you try them! They are made with a pork or beef filling, so make sure you specify if you want both or only beef. The one pictured is beef buns as we let Chef Wong choose for us. I couldn't get my boyfriend to surface to tell me what he thought of them until after he polished off his. Yup, they're that good! On the same dish is Pan fried wor-teep (dumplings). 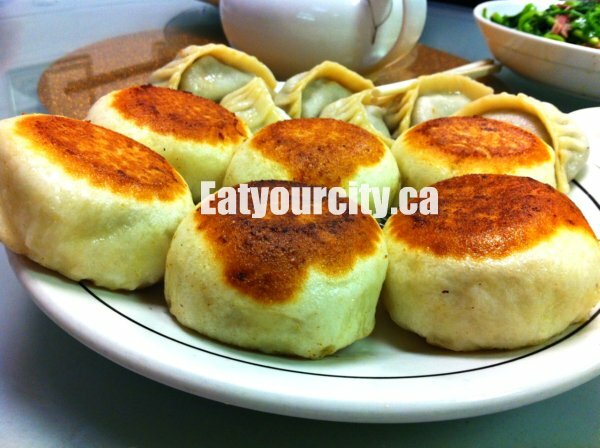 We couldn't pass up on these dumplings that are filled with your choice of pork or beef and brimming with a rich savory broth and pan fried till they're lightly browned and crisp. Mmmmm. My aunt caused a round of laughter as she accidentally squirted anybody or anything nearby as she haphazardly bit into these dumplings. Whoops! You have been warned, they are juicy! 2) The traditional "xiao long bao" or "tong bao" - literally translated as "soup dumplings" are addictively good as usual- after we gently wrestled and juggled the dumpling into your bowl without piercing the super thin dumpling wrapper... we started a xiao long bao war at our table. My aunt forgot they were full of rich hot soup and a savory little nugget of meat inside, and nearly squirted everyone at the table when she bit into her first and subsequent forays into the tasty dumplings. Heehee! 2) The double cooked duck "Hang sew gn-ap" - stewed and then deep deep fried to a flaky crisp is unique and tasty. Parts of the duck is so crispy, its like eating duck chips, and other parts tender and moist. As duck doesn't have much meat to it, if you are going in a larger group, get a full order rather than the half order. 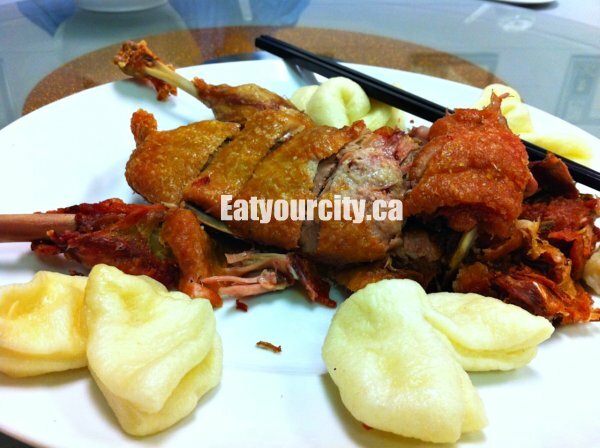 Its served with little plain white steamed buns in the shape of fortune cookies to balance out the richness of the duck. We always eat most of the duck before we remember to eat them with the buns.. whoops! 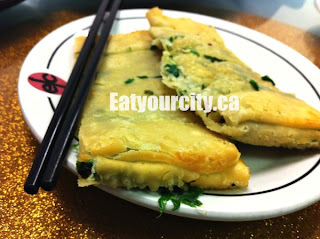 3) The chive pastry or "gow choy so hap" is similar to an onion cake, but instead of green onions, the crispy pastry is not as layered and is stuffed with chives and small bits of scrambled egg. This makes for a more filling and hearty bite compared to the ubiquitous greasy onion cakes you can get at almost at every Chinese restaurant in town. 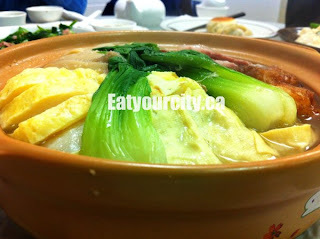 4) The Buddha's feast or "yut bun wor" was a hot pot of goodness we always order. Toppings vary depending on what the chef had prepared. 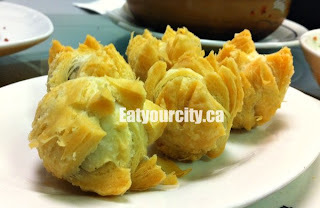 All the fishballs and seafood creations are made in house everyday. Tonight, we had green pea sprouts (not seen) and baby bok choy, swimming with slices of slightly smokey pork belly, an in house made vegetarian roll made of Chinese mushrooms, fish paste all rolled up in a thin scrambled egg roll, enoki mushrooms, chicken thighs, in house made deep fried fish balls, soft tofu, fried tofu, scallop mushrooms, and green onions all nestled upon a bed of suey choy and rice vermicelli noodles. My dad practically finished all of the savory light broth it came in by himself! 5) The "woo wor yook or braised pork belly was an instant hit. Often called the "gold" part of the piggy, any bacon lover will love this dish. 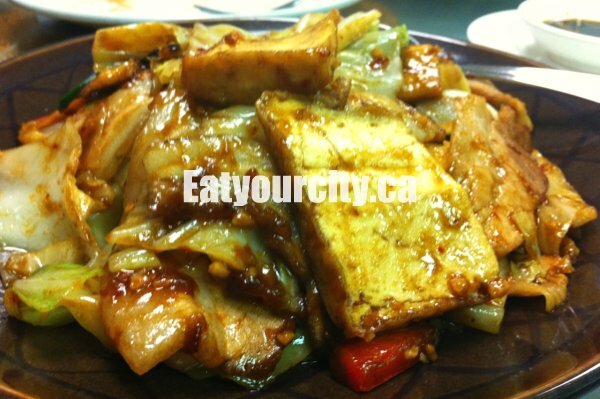 Thick pieces of pork belly is braised in a sweet and mildly spicy sauce with a variety of veges added in - sweet bell peppers and broccoli, and a few pieces of fried tofu to soak up the sauce. The pork belly gives plenty of flavor, with the fat part almost crisp tender in texture. So simple, but sooo rich and tasty! 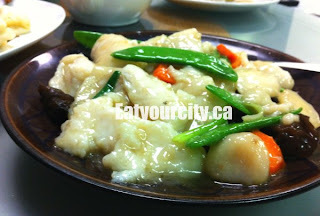 6) Sauteed fish with vegetables "Chau lau yiu peen" - These pieces of white fish fillet are super silky tender, especially when they are laced with a light savory glaze. Mixed veges round out this light fish dish. Seafood lovers at our table made the dish disappear so fast, I only had a chance to eat two pieces.. waaah! 8) We finished with a plate of Black sesame puff pastry flowers - crisp phyllo pastry in the shape of flowers encasing a smooth sweetened black sesame filling. We were all so full, we had to sit back to digest before we could tackle these tasty babies and sent our thanks to the kitchen. We always enjoy chatting with Chef Wong (or Wong See-Fu! ), as he always makes himself available at the end of the night to chat with customers. Shanghai 456 remains unpretentious to the nth degree, with the food consistently tasty, the xiao long bao and pan fried buns are made fresh as you order... these special pan fried buns and xiao long bao are something you can not pass up! Chef Wong says "you have to have a passion for food and love it if you've done it as long as I have". How long? "Oh, I started back when I was thirteen... so that makes fifty plus years now!" In that case, I hope we see many more years of wonderful eats ahead! Hmmm I love san jeen bao, and xiao long bao too. Another must try for the next Edmonton trip. Update - the old location at the Airport cafeteria has closed but they're up and running in new digs at 14456 118 Ave NW, Edmonton, AB!